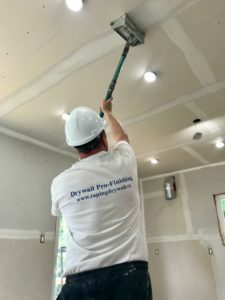 At Drywall Pro-Finishing, we not only are doing walls but also ceilings! But, how do we do that? Today we are going to get into exactly this! Let’s say you have discovered a hole, crack or some damage to your ceiling. What can you do about that? Your best solution: call us! Walls being a stand-up structure are much more doable by yourself if you find some damage but on ceilings it is much, much more complicated. There is angling and height involved and a lot more know-how. So, how do you repair a ceiling? You will first need a ladder, a long drywall brush, drywall paddy, your drywall plasters, a drywall jack and your knives. Let’s say it is a hole. Go up to the hole in your ceiling and examine it. You will need to remove the whole portion of the ceiling and a install a new plaster board. First, find the beams or ‘studs’ in your ceiling to find out where you will screw into your new plasterboard. You can locate them by using a stud finder that you can purchase at your local hardware store or by using a rubber hammer and your ears and hearing a heavier than usual ‘thump’ and marking it. Cut around the stud and install the drywall plasterboard in the ceiling, you will want to use half-inch or even 5/8” inch thick panels to prevent sagging. To lift up the plasterboard you will need a partner, a drywall jack and drill to screw in the plasterboard. Match the board with the spacing that you have left for the new one to come into place and insert it in and proceed with screwing in the board. Now that the board is screwed in you may proceed with muddling and smoothing with your drywall brushes. Apply as much drywall as needed. Let it dry and smooth it out some more. Once it is completely smooth you may paint over the ceiling with a desired paint colour. What has been explain to you is just to demonstrate how to replace ceiling damage. Of course, the more extensive the project is, the harder it becomes to complete it. Why not let the pros finish it for you? With years of experience we know how to do the job right and how to be resource mindful. Ceiling jobs are complicated and you must always keep safety in mind. Always wear protective gear and do not proceed if you are not sure about to do because it can quickly become dangerous if undertake a ceiling job all by yourself. At Drywall Pro-Finishing, we keep safety & productivity in mind. We are always looking forward to be in touch with you and completing your drywall projects for you. Contact us today if you have any questions or if you wish to find out more about how we can finish the job for you. Stay tuned for more Drywall related news, info and advice from Drywall Pro-Finishing and, as always, stay constructive! This entry was tagged ceilings, fix, toronto. Bookmark the permalink.